Memories from my childhood. I drew this recently. Old KWSC radio tower in Pullman, WA. before 1970. 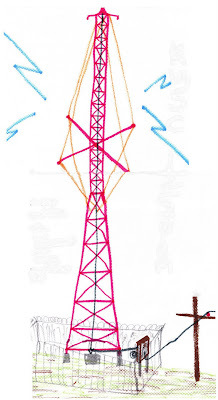 Only example of a radio tower with both guy wires and self supporting structure that I've seen. Lower half of the tower is self supporting with no guy wires while the upper half uses guy wires that are stretched over 4 spacer bars. The wires were attached to tower's midpoint; kind of like a ship's mast. Around 1970, this tower was replaced by the current KWSU tower that is west of town. Present tower is an example of guyed support from the ground up with no self supporting section; more typical in AM towers of modern times. Call letters for KWSC were later changed to KWSU. Before 1970, transmitter was in an old house quite a ways from the base of the tower. That house was down a hill and across an arterial called Stadium Way. A long feed line from transmitter to tower presented some idiosyncrasies. One day, the station was knocked off the air when someone practicing archery hit the line with his bow and arrow. I think it made national news, if my memory is correct. Riding along Stadium Way in my parents car met having KWSC bleed in all up and down the dial of the car radio while passing under the transmission line. The station also bled in on phone lines in Troy Hall where my dad had his office. Mozart would often be in the background of his phone conversations. That was during my grade and middle school years. Photo below taken from hillside several blocks east of where that tower stood. Tower was torn down in late 1970s or early 80s. 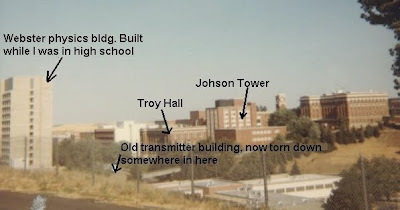 Right behind Troy is Johnson Tower where I visited a psychologist from late 8th grade through my high school years. Just found out from my sister (Aug 1 2010) that my dad and a few others had victory gardens during World War II. The gardens were on land next to the old KWSC transmitter building. They reused cooling water from the transmitter for irrigation.